Resale of exclusive products Afford to Italy, a leader in research and manufacture of inks and colors for professional printing. In particular, there are all inks compatible with the following printheads: Epson, Xaar, Konica Minolta, Kyocera, Spectra. 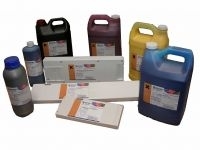 Resale exclusive products for Italy, a leader in research and production of inks and colors for professional printing. In particular, there are all inks compatible with the following printheads: Epson, Xaar, Konica Minolta, Kyocera, Spectra.